Constitutional Construction argues that the Constitution has a dual nature. The first aspect, on which legal scholars have focused, is the degree to which the Constitution acts as a binding set of rules that can be neutrally interpreted and externally enforced by the courts against government actors. This is the process of constitutional interpretation. But according to Whittington, the Constitution also permeates politics itself, to guide and constrain political actors in the very process of making public policy. In so doing, it is also dependent on political actors, both to formulate authoritative constitutional requirements and to enforce those fundamental settlements in the future. 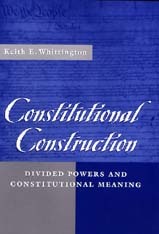 Whittington characterizes this process, by which constitutional meaning is shaped within politics at the same time that politics is shaped by the Constitution, as one of construction as opposed to interpretation. Whittington goes on to argue that ambiguities in the constitutional text and changes in the political situation encourage political actors to construct their own constitutional understandings. The construction of constitutional meaning is a necessary part of the political process and a regular part of our nation's history, how a democracy lives with a written constitution. The Constitution both binds and empowers government officials. Whittington develops his argument through intensive analysis of four important cases: the impeachments of Justice Samuel Chase and President Andrew Johnson, the nullification crisis, and reforms of presidential-congressional relations during the Nixon presidency.